LENTZ RESURGENT GRAINS mark Lentz Emmer Farro as a regional favorite. Emmer, Triticum diccocum, in its wild form Triticum diccocoides, is a cross of Einkorn and a grass since gone extinct, the outcross occurring 500,000 years ago, according to USDA research. 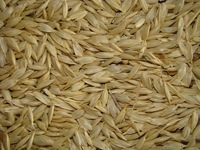 Emmer is a German word, from Old German Amer meaning hulled grain. It’s a tetraploid with 28 chromosomes. 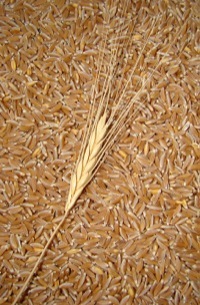 Just as Einkorn so ranks Emmer as an original crop at the advent of agriculture in the Fertile Crescent. Its importance can be judged by the oldest-dated coin, from Sumeria, that pictures a grain head of Emmer, the goddess of fertility, Ishtar, on the other side. 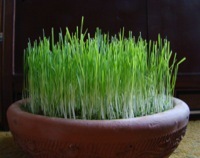 For the Israelites, Emmer held a special place because they harvested the wild Emmer in the hills during their Sabbath years. In Egypt, Emmer was paramount to the culture of the pharaohs. In fact, it’s rather likely that the first sourdough loaf was of Emmer flour. Emmer fed the Roman legions, and Emmer held a prominent place in Roman wedding ceremonies. Emmer is the grandmother of durum, also a tetraploid grain, and like durum so does Emmer excel as pasta and flatbread Mediterranean-style. Emmer flourished through the centuries, though not as a primary crop in most regions. When industrialization came along it did away with the hulled-grain Emmer, which consequently diminished to almost nothing. The resurgence of Emmer, as that of Einkorn, began in Italy when wholesome foods were recognized as the superior alternative to industrialized crops. Elsewhere in Europe, Emmer made her first comeback in the context of wildlife, as governments demanded from farmers they raise organic crops where it was of benefit to shrinking species – and the farmers then remembered a crop their forefathers had grown so successfully before chemicals, namely Emmer. It wasn’t long before chefs and brewers learned to appreciate the outstanding aroma of Emmer; at a recent European beer competition, an Emmer brew fetched second price. Lentz Emmer Farro is a landrace variety that’s adapted to Columbia Plateau soils and climate; since we raise our own seed, the traits of our Emmer are unique. The better nutrient uptake of the Emmer plant compared to that of wheat assures you of high levels of vitamins, minerals and antioxidants. Protein varies from crop year to crop year, but generally it’s a lot higher than that found in wheats. The Latin root of adore referred to offerings to the gods; since Emmer grain was one of the earliest customary offerings, her link to adore is handy – adore the taste, be it Emmer pancakes, pasta, pizza crust!